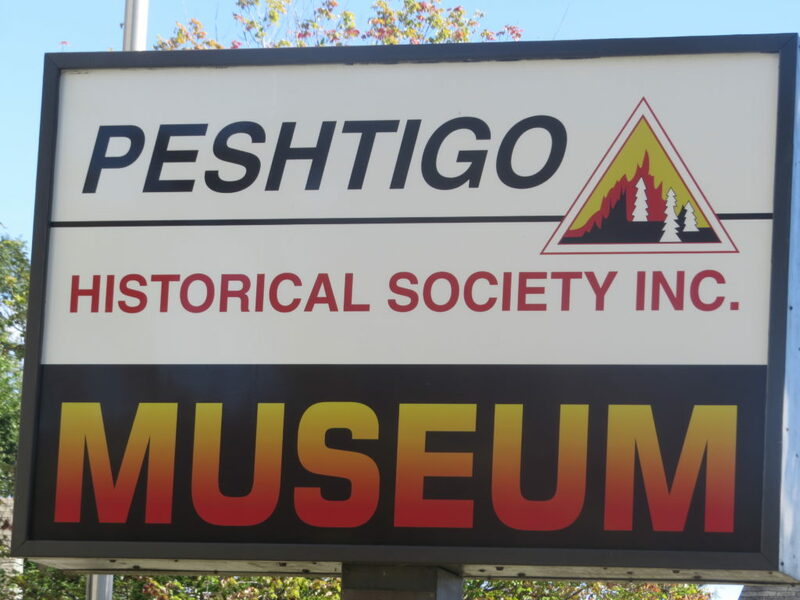 The Peshtigo Historical Society staffs and maintains the Peshtigo Fire Museum and Cemetery. The Historical Society meets the first Monday of the month from May through December at 6:30 pm in the Drees Center, 600 Pine Street, Peshtigo. The public is invited, and new members are welcome. Annual membership is $5. The Peshtigo Fire Museum is located on the site of the Catholic church that Father Pernin lost in the fire. The building is the first church rebuilt in Peshtigo after the fire and is actually the former Congregational church. The building was moved to this location after the Catholic church on that corner was destroyed by fire (again) in 1927. 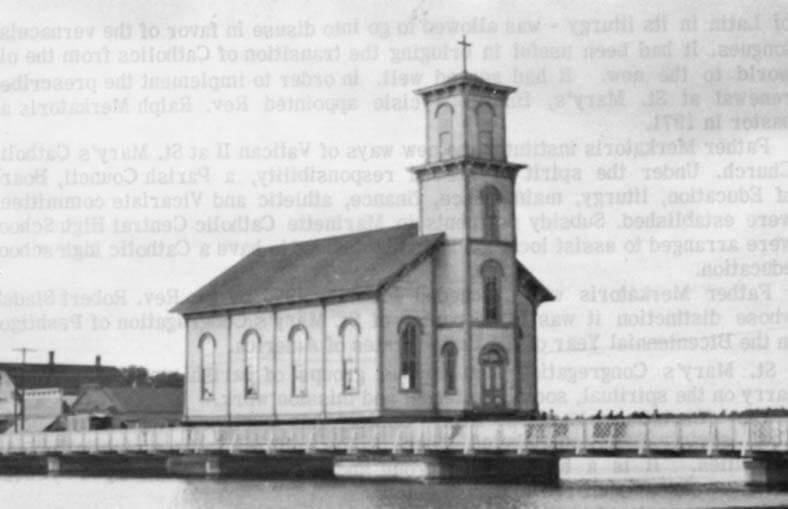 When St. Mary Parish built a new church a few blocks away, the Congregational church building was acquired by the Peshtigo Historical Society. It became home to the Peshtigo Fire Museum in 1963. The memorial marker for fire victims located in the Peshtigo Fire Cemetery is the first official Wisconsin state historical marker. It was erected by the citizens of Peshtigo in 1951. Visitors are welcome to explore on their own or hear stories about the fire from the museum guides. Presentations for groups of ten or more can be scheduled—just call 715-582-3244 (during the open season) or fill out the presentation request form. Historic structures and outside areas provide challenges that make it difficult to provide complete access to all visitors. Please contact us with specific questions and concerns. The cemetery has a Mass Grave for 350 victims of the fire who could not be identified. Many of the gravestones have a corresponding story of the deceased. A map of the cemetery can be found at the museum as well as here. 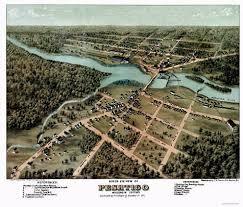 Peshtigo is a city of 3,500 people in northeast Wisconsin, located about 50 miles north of Green Bay. For more information, visit the city website. On October 8, 1871—the same night as the Chicago Fire—the Peshtigo Fire roared into infamy as the deadliest fire in US history. It killed more than 2,000 people and burned over 2,400 acres, most of it timber, thereby destroying the local economy. 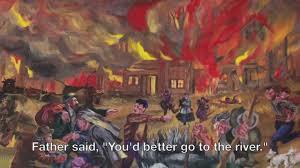 Heat, drought, logging practices, and atmospheric conditions combined to create a firestorm that completely destroyed the community of Peshtigo. Pernin, Peter. The Great Peshtigo Fire: An Eyewitness Account. State Historical Society of Wisconsin, 1999. Knickelbine, Scott. The Great Peshtigo Fire: Stories and Science from America’s Deadliest Firestorm. Wisconsin Historical Society Press, 2012. Wells, Robert W. Fire at Peshtigo. Prentice-Hall, 1968. Sandler, Martin W. Lost to Time: Unforgettable Stories That History Forgot. Sterling Publishing Company, Inc., 2010.